The Persians also had an asset in the form of Sapor, the wily and experienced monarch whose reign was to end up lasting 70 years and who knew how to exploit every situation to his own advantage. The treaty the two powers had agreed in 363 had made Armenia nominally into a neutral country. The Persians soon subverted this to gain effective control. This was done with minimal subtlety. A Persian army simply deposed the pro-Roman monarch and replaced him with a pro-Persian one for the first time since the reign of Nero over three hundred years before. A long standing Roman advantage had been neutralised. The heir to the Armenian throne escaped and took refuge at the emperor Valen’s court. He could well have been turned into a trump card for the Romans to play. The legitimate Christian king of a largely Christian country was the ideal person to lead a Roman counterattack. But Valens ruling the East from Constantinople did not want to provoke another war with the Persians. He was very determined on this. When the Armenian royal started behaving in a way that could have made trouble, Valens ordered him killed. This was done in a particularly ham-fisted and public way which must have harmed Rome’s prestige in the area and handed the Persians a free PR opportunity. In recent years the diplomatic world has been impressed by a concept coined by Joseph Nye, a political scientist at Harvard called ‘soft power’. This is the amount of influence you have by virtue of how appealing your culture and ideas are, and how well you behave. They didn’t have a word for this idea in the ancient world but they certainly had the thing. Betraying potential Christian allies to their enemies must have reduced the Roman’s soft power. Any potential allies would certainly want to think twice if that was the way a friend of Rome could get treated. The trouble with soft power is that it is hard to track and to assess, especially for a state so long ago in history. It is hard enough in the present day. If you look for instance at how eager European politicians were to get a photo opportunity with Bill Clinton (or Barak Obama for that matter) compared to George Bush, it isn’t hard to make a case that the US had less soft power under Bush than under Clinton. But how big an effect was this? It is hard to measure. I guess that the differences between US presidents probably don’t turn out to be that signficant. Both parties in the US follow much the same foreign policy and at the end of the day America remains America. But it doesn’t follow from that that soft power is never significant, and I think it can often be decisive. For example, I can see a big role for soft power in resolving the crisis of the Third Century in Rome’s favour, a time when it seemed to have become remarkably short of hard power. The continued existence of the empire was certainly under threat. That it pulled through might well have been down to the positive feelings so many people had towards the empire. At one point Rome itself was under threat, but the population, the priests and the emperor all pulled together in its defence. This public spirit does not seem nearly so evident in the fourth century, and crass and untrustworthy behaviour by Valens might have made a very big contribution to this. But it is easy to see why Valens felt he had other priorities. The Goths that had entered the empire at the behest of Procopius were still around, even if his rebellion had failed, maybe 30,000 of them. Having penetrated the empire’s defences they were not inclined to return home empty handed. And the situation amongst the Germans was beginning to look quite alarming from the Roman point of view. The empire had relied on maintaining the disunity of the German tribes. But a Gothic king called Hermanric had taken huge strides in establishing unity. He had established an extensive kingdom covering Crimea, Ukraine and Poland. His descendants later remembered him as a Gothic version of Alexander the Great, only with the rather significant difference that he was a late rather than an early starter. His conquests started at the age of 80 and continued until his death at 110. Valens and his able cavalry commander Victor started rounding up the Goths who were creating chaos in the Balkans in the way that Goths tended to do. This proved to be a tough enough job in itself, but a delegation turned up at the court of Valens from Hermanric. This demanded fair treatment for the Goths who had, after all, simply responded to a summons from a legitimate member of the previous imperial family. In fact, rather than be treated as enemies they should rather be seen as diplomats with corresponding immunity, and that all prisoners taken should be released. The Goths had no doubt been moving up socially over the centuries of their contact with the civilised Romans. They were probably a bit more sophisticated than the tribesmen who had nearly overwhelmed the empire in the third century. But even so, I can’t help but wonder what the polished and effete courtiers of Byzantine Constantinople made of these illiterate Germans turning up and behaving as if they were actually somebody. In fact the kinship wasn’t that close, Hermanric was a ruler of the Ostrogoths, and the ones who were causing the trouble were Visigoths, so Hermanric only had a mild claim to jurisdation.Whatever, Victor turned their demands down out of hand. You can’t really blame him, it was an outrageously cheeky request. But it is a good question as to whether the Romans ever realised just how powerful a monarch they were dealing with. Clearing the Goths out took three years, and was a huge burden on the resources of the Eastern Empire. In the West, Valentinian took note and continued with his building up of the defences. This brought him into conflict with the Quadi on the north shore of the Danube, roughly modern Austria. The Quadi had been the terror of Rome during the reign of Marcus Aurelius some 200 years before, but their relationship with the Romans had mellowed with the passage of time. They lived right on the borders of the empire and generally got on with the emperors. So when they noticed the Romans were laying out the foundations of a fort right in their land their first reaction was simply to register a complaint. At first their objections were taken seriously and the scheme was halted while it was investigated. However, a newly appointed and well connected young official who was still a bit wet behind the ears intervened. He decided that the Quadi needed to be put in their place. Their king was invited to a dinner, ostensibly to discuss matters. Then during the meal he was brutally and publicly killed. This incensed the Quadi who instantly invaded the province neighbouring them and took their revenge in the form of stealing whatever was valuable and portable and destroying whatever was valuable and immovable. This was an episode that again showed the empire to be run by the the untrustworthy. But it was also incompetent. Large numbers of troops were at the time deployed in Africa dealing with the troubles in that region. The last thing that should have been done under the circumstances was to gratuitously create another crisis. And a crisis indeed it was. The Quadi had been joined by some Sarmatian horsemen. 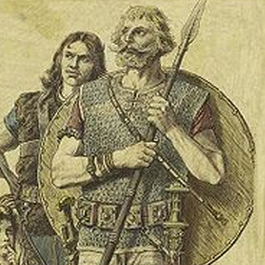 They reached as far as Sirmium – the largest city in the danube region – but were repelled. They did however manage to eliminate two whole legions in the field. They were helped in this by disagreements between the Roman commanders over who took precedence. In the end, precedence scarcely mattered since they both ended up dead. Luckily a young general was on hand whose priority was defeating the enemy. This was Theodosius, the son of the Theodosius who was currently doing well in Africa. The young Theodosius did not let down the family name, and indeed this was the starting point of a career that would take him even higher than his father had managed. Valentinian was outraged when he heard the news. But judging by his actions he was probably not given the whole picture. He now moved his forces from Gaul to deal with the Quadi – a difficult but necessary task. But he didn’t do an easy but equally necessary thing while he was at it, which was to deal with his bungling officials. He was presented with an ideal opportunity to do so as well. On arrival at Sirmium he was greeted with the usual empty flattery by the local dignitaries and functionaries. But as chance would have it, one of these was a man called Ithicles who was dedicated to the philosophy of cynicism. As a good cynic, he was heedless of his personal interests and even his safety and so saw no good reason to lie when the emperor asked him what was going on. Ithicles replied that the people, who knew very well what had caused the problem, were groaning. But Valentinian, who might even then have stopped the war by apologising for the killing of the king of the Quadi chose to back his agents and eliminate the invaders. He deployed the relentless Roman approach to killing people honed over centuries. This continued until the winter compelled operations to be halted until the following spring. The Quadi knew that when the troops returned their days as an independent kingdom, or indeed walking around on two legs, were likely to be short lived. So in the middle of winter, a delegation of Quadi sought out the emperor and attempted to negotiate a peace. This threw Valentinian into one of his characteristic rages. In the middle of it, he burst a blood vessel and died minutes later. Roman emperors had died many and various deaths over the centuries. But the death of Valentinian really is one of the classics. It was at the same time, both surprising and unpredictable but sort of characteristic of him. I think that is how he would have wanted to go, mid rant and beyond contradiction. It is hard to portray Valentinian as a truly great emperor. He left too many unresolved problems and showed a pig headedness that undermined a lot of the good his soldiering skills achieved. But he was competent enough and his attempt to rebuild the defences might have proved valuable if a successor of his ability, or preferably a bit better had emerged in the following years. As it was, he was to be the last of the Romans in the West to be in a position to really set the agenda and project power effectively. This hid his biggest weakness, which was letting his courtiers get the better of him. His son, Gratian, succeeded him. But he was only 17. This opened the door to intriguing and plotting, and these were to be characteristic activities of the actors joining the stage for the last couple of acts of the Roman Empire in the West. We will not see another leader like Valentinian, he was in many ways the last real Roman.